Hartlepool Borough Council has just launched a brand new range of merchandise featuring the Hartlepool Railway Station Artwork. The new merchandise came about after a huge response to the initial illustrations my partner Owen Smith and I created last year. I recently caught up with the council and Hartlepool Art Gallery to discuss what has been a very successful few months. The start of this journey began 15 months ago, when I worked on what has so far been one of the biggest projects of my career. Together with Owen, I created twelve vintage-inspired illustrations based on tourist destinations in the area, which have since been on permanent display at Hartlepool Railway Station, with A4 and A3 prints also released for sale. Pictured (L-R) are Abigail Taylor, Owen Smith, Councillor Christopher Akers-Belcher and Francis Fitzgerald, from Cleveland College of Art & Design. This project became a great springboard into my self-employment career, and I have since been able to work on other commercial illustrations for The Northern School of Art and Roseberry Topping for Vintage Financial planners, as well as releasing my own work of my hometown Stockton-on-Tees. With many other illustrative projects in the pipeline, it looks to be an exciting year ahead. 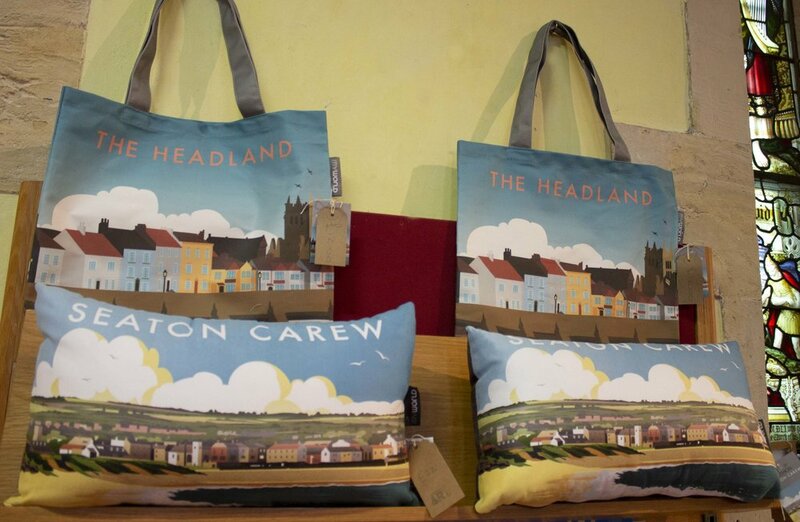 More excitingly, Hartlepool Borough Council have recently secured funding to expand the range of products beyond the initial prints, with tote bags, tea towels and mugs all now available at Hartlepool Art Gallery. I first spoke to Rob Smith, the Regeneration Team Leader at Hartlepool Borough Council, who helped put together the original brief and has had huge involvement with the project from the very start. When asked about the impact the illustrations have had since their release, Rob said ‘The artwork has been really successful for the council. It's creating a real sense of arrival into Hartlepool station and a strong first impression, even for those just passing through. The artwork has also meant the Railway Station has become more of a gateway into the town. The illustrations showcase the full range of local attractions to the public and have raised the profile of some of the lesser-known destinations, as well as just brightening up the area and making it look more inviting. The imagery is owned by Hartlepool Borough Council with A3 and A4 prints currently being sold at Hartlepool Art Gallery, which is based in the beautiful former Christ Church building. Inside the Art Gallery, there is a shop selling local products, a cafe run by a local school. They also provide tourist information, in addition to promoting and selling tickets for Hartlepool Town Hall Theatre. I spoke to Ashley Landsbury, the Museum and Art Gallery Manager. Out of curiosity, I asked Ashley which have been the most popular illustrations out of the twelve. So far the bestsellers have been, the Clock Tower at Seaton Carew, St Hilda’s Church, The Town Wall at the Headland and Ward Jackson Park. Ashley also found people have mainly been buying the prints of areas which they live, previously lived or which evoke memories for them. They are often bought as gifts for people who have moved out of the area too. It really has been a momentous year for all involved with this project, and I couldn't be happier with the results we've had.